Frau Helga's Butter Stollen...a unique cake-like bread, the most elegant of pastries at Christmas. Butter Stollen, baked with pride by many American & European bakers, Frau Helga's follows that tradition, using only the finest ingredients...her moist Dresden Butter Stollen is completely hand made. 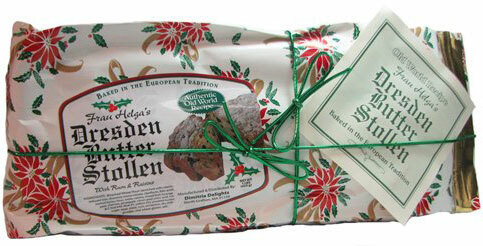 Frau Helga's Dresden Butter Stollen is the benchmark for all Stollen. Originally produced in the city of Dresden, Dresden Butter Stollen, a truly moist heavy bread filled with fruit, is still the most famous Stollen, & dates back to the Middle Ages. Raisins & fruits are soaked in pure Caribbean Rum for several days, bursting with flavor, the raisins & fruit are carefully kneaded with 100% butter yeast dough & baked to perfection...Frau Helga's Butter Stollen at its finest!!! Each loaf is cooled & then slathered again with unsalted butter & topped with flavorful cinnamon sugar. Frau Helga's Butter Stollen...a traditional German Christmas cake, has also become a traditional symbol of love & friendship! 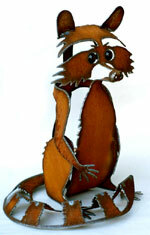 Order now for the Holidays, Limited Availability!!! Frau Helga's Dresden Butter Stollen. Hand wrapped in a gift bag featuring Poinsettias & secured with shiny green ribbon.